Information on student mastery is a critical element in the educational decision making process. To ensure the availability of appropriate data associated with multiple types of educational decision making, Galileo technology offers a broad set of ready-made, standards-aligned reports. For example, educators have expressed to us the importance of analyzing trends in student learning. Therefore, our team of developers created and added the Student Growth and Achievement Report to the menu of ready-made, standards-aligned reports in Galileo. This report provides a graphical cross-classification of students based on their growth between two tests and their achievement on the second test. This graphical summary is designed to facilitate the identification of student groups for intervention and enrichment (e.g., high performing students showing inadequate growth, low performing students showing exceptional growth). Curriculum Monitoring Reports provide the ability to monitor both the progress of instruction and evidence of student learning for each standard in a district curriculum. “At-A-Glance” Overviews present highlights of data from multiple sources in one convenient location with direct links to more detailed reports. Development Profiles provide counts and percentages regarding student performance on each of the standards assessed on a test. Ideal for monitoring progress in mastering specific standards. Development Summaries present a series of standardized scores that summarize development at the individual student level or at various other levels of aggregation (e.g., class, individuation group). Ideal for monitoring progress in terms of the relative standing of a student, class, or school. Aggregate Multi-Test Reports provide Developmental Level scores for multiple tests presented on a common scale used to monitor progress and estimate mastery. These reports include two important forecasting tools for district-wide assessments: the Benchmark Performance Levels and Risk Levels displays. 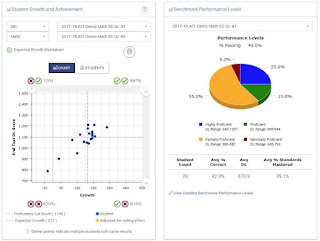 Display Benchmark Performance Levels Option provides counts and percentages of students at each of the statewide assessment performance levels. The user can drill down to identify the students at each of these levels for each benchmark assessment. Presented simultaneously for multiple assessments in order to monitor progress. Display Risk Levels Option uses patterns of student performance across benchmark assessments to identify and monitor groups of students at various levels of risk with regard to passing statewide assessments. The user can drill down to identify groups of students at each level of risk for intervention. The report identifies standards for which intervention is required. Testing Reports provide various types of information about tests, including item analysis (the pattern of student answers for each question), test scores aggregated at various levels, and Item Response Theory parameters for each item on the test. Administrative Reports facilitate monitoring system activity including tracking administration of district-wide assessments, real-time monitoring of student progress during assessment administration, and user activity. Galileo Dashboards provide users a centralized location from which to view and interact with actionable, real-time data on student learning. Dashboards contain easily interpreted graphical reports that make it easy to identify trends in student performance. These reports also provide educators with actionable data and the right tools for facilitating data-driven, standards-based differentiated instruction based on skill mastery, standards mastery, and pattern of progress. Student growth data and performance measurements can be accessed quickly from the Teacher Dashboard reporting options. Galileo reports are generated from reliable and valid assessment results from district-wide benchmark, pretests and posttests, end-of-course, school/district and classroom formatives, and an array of other Galileo assessments. Report data details student learning in a number of ways including student mastery of standards, next instructional steps to promote learning with continuous tracking of student progress, and forecasting of student performance throughout the year. To learn more about the broad set of Galileo reports, access our website or contact a knowledgeable Field Services Coordinator.